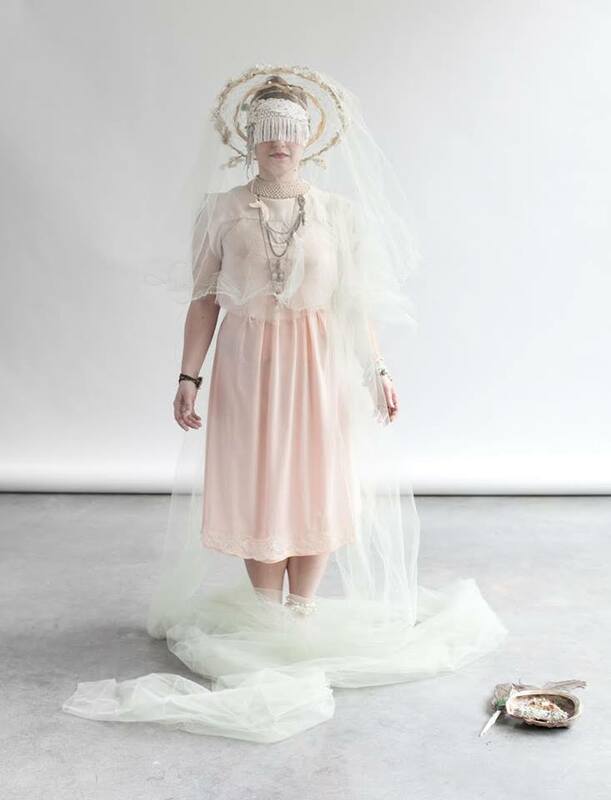 Thursday evening: the pop-up, one-day-only art gallery Vignettes is open on Yale Ave.
On Thursday, you can also join the Capitol Hill Community Council Meeting at the Cal Anderson Shelter House at 6:30pm for their transportation-focused agenda. Or join the Capturing Violence: a community discussion at 7pm at Northwest Film Forum. Teen Witch concludes the Three Dollar Bill Cinemas movies in Cal Anderson Park on Friday. Starts at dusk (8:45ish) but get there early for good seats on the grass and pre-show music and games. The drama Other Desert Cities opens at Eclectic Theatre this weekend, and Balconies continues at Annex Theatre. Relay for Life teams will be day-camping and circling Cal Anderson Park on Saturday to raise funds for the American Cancer Society, 10am – 10pm. Are you tired of your long hair? Get a free haircut and donate your locks for wigs at the Pony Up! table, 12p – 2pm. Pistil Books’ annual sale is Saturday afternoon in an alley off E Union, Rugby is a Drag (Rugby players! Performing! In drag! Hot!) is Saturday evening at Neighbors, and then there’s Linda’s Fest on Saturday. 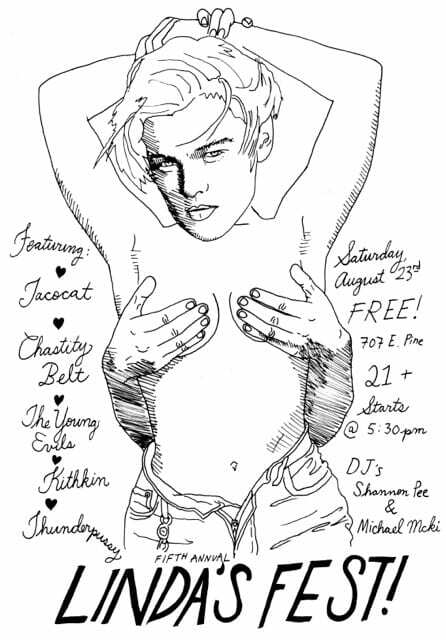 Linda’s Fest is free and fun and loud and runs 5:30- 10pm in the back lot of Linda’s on Saturday. Food and drink specials, plus fun bands. CHS wrote about the fifth annual event celebrating Capitol Hill bands here. Saturday, the second annual Hopscotch CD event creates 2.9 miles of hopscotch play areas across the Central District. Included in the fun, Centerstone’s parking lot at 722 18th Ave will host the grandmamma of all hopscotch games in an attempt to break a world record. 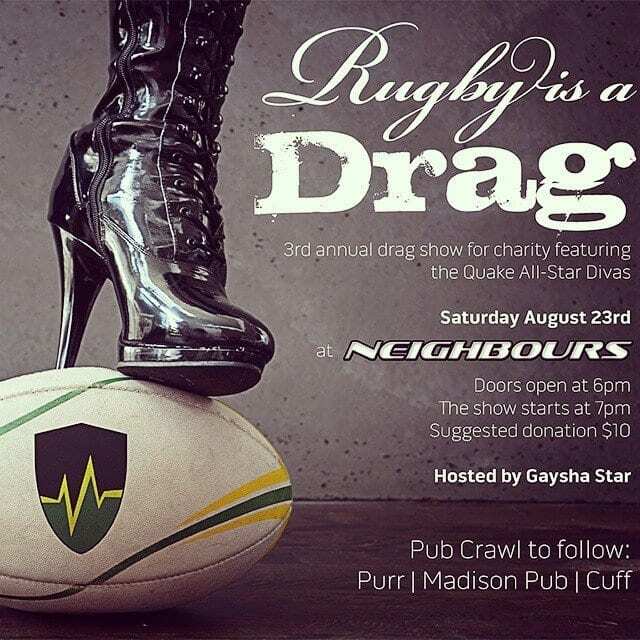 What charity is benefiting from the Rugby’s a Drag event? The poster is suspiciously vague. I went to a Rugby Quake “charity event” at Neighbours in 2012. I entered the raffle and won the grand prize. They took my contact information, but never delivered the prize. I even messaged back and forth with the VP of Quake Rugby, Michael Farris, for 2 months, but he kept saying he was really busy. After the last undelivered promise, I gave up. Wonder where the money went.